John Cox said he was lucky to escape today still in the lead at the Harris Chain. Now, it’s a matter of whether John Cox can slam it shut or if someone else in the top 5 (or lower) can bust through with some final-day heroics. Cox had the opportunity to put some serious distance between himself and the rest of the field today at the Harris Chain FLW Tour, but his third straight day of sight-fishing produced just 10-04 (his smallest bag of the tournament) and his lead, which was nearly 6 pounds this morning, is now down to 2-02. Also, his sight-fishing opportunities may be dwindling with overcast, windy weather in the offing for Sunday. 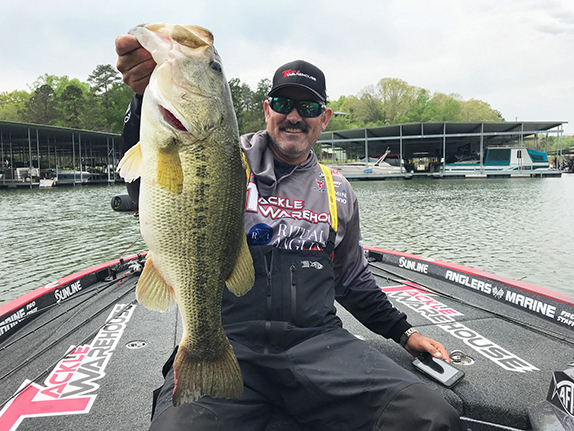 Cox’s 54-14 total through 3 days has him in the lead for the third straight day, but it’s a tenuous position considering the rest of the top 5 is now within 3 1/2 pounds of him. The parade of Cox’s challengers is led once again by Shane Lehew, who’s perched in 2nd for a third straight day. Lehew also caught his smallest bag of the week (13-15). The one to watch tomorrow may be Matt Reed, the former Elite Series mainstay who transitioned to the Tour this season. His weights have steadily increased each day and his 18-10 today was tops among the 20 anglers. His 52-08 total has him 4 ounces behind Lehew and just 2-06 off Cox’s pace. 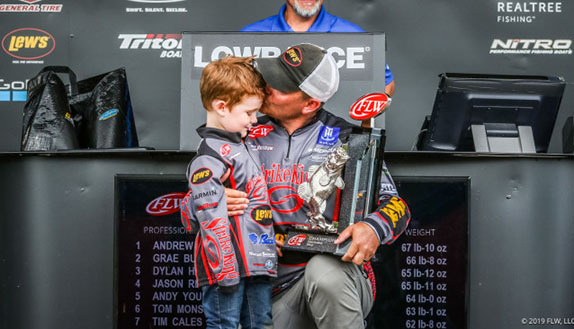 Despite slipping one spot to 4th, Bryan Thrift’s amazing run continues – this is his fifth straight top-10 cut (an FLW Tour record) – after he caught 15-00 to push his total to 51-13. Bradley Dortch had 51-07 in 5th after hauling in 15-01 today. Chris Whitson made up 11 spots today to 8th with a 16-08 bag to collect his second career top-10 cut. 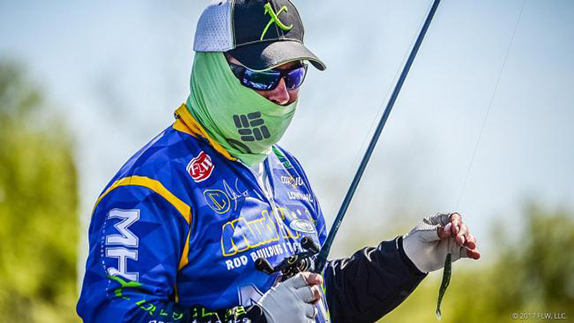 California rookie Aaron Britt hauled the biggest bass caught this season to the scales – a 9-08 behemoth – and it spurred him to his first top-10 cut. He has rallied 92 spots in the last two days. 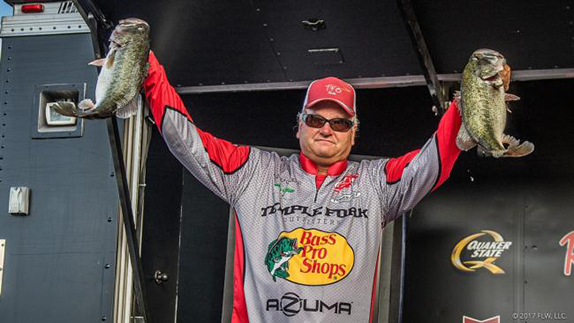 Local ace Tim Frederick made the long run to Lake Apopka today in hopes of finding some untapped areas, but he slipped out of the top 10 with three fish for 10-02 and finished 14th. Jim Moynagh, who’d been in the top 6 each of the first two days, fell out of contention with a small limit today that pushed him down to 15th. With sight-fishing opportunities starting to dry up and a round of overcast and windy weather on tap for Sunday, the stage is set for casting and winding to take a more prominent role in how this event is settled. 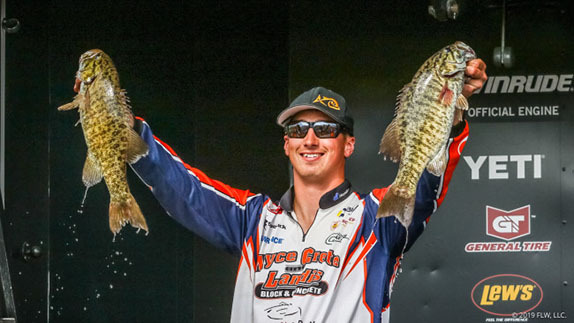 The finalists have caught their fish from an array of lakes doing a little bit of everything (flipping, looking, cranking, dragging), a testament to the health of the entire chain. Cox may have to abandon his sight-fishing plan on Sunday. 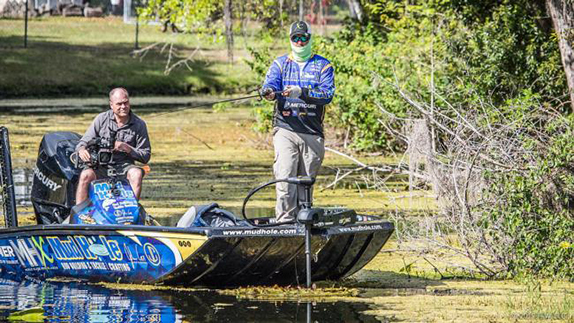 Cox devoted his entire day again to looking for fish. The ones he found, however, weren’t quite ready to cooperate. It left him scrambling and he came away feeling fortunate to have caught a limit. “Today was just unfortunate,” he said. “I moved around a lot and stumbled on two 3 1/2s. They weren’t ready. They were on the beds and cleaning them and the females were right there. I don’t know what they were waiting for. He’s not discouraged, though. He has plenty of history throughout the chain and will probably transition to some moving baits tomorrow. He thinks a 15- or 16-pound bag will get him the win. Lehew was thrilled about locking up his first top-10 cut as a pro. Now, he’d like to sew up his first major victory. He thinks his sight-fishing opportunities are maxed out (he caught one that way today) and he’ll probably spend most of his time Sunday around some pads in Little Lake Harris, where he thinks the shad are starting to spawn. “I caught a limit quicker today than the whole time I’ve been here,” he said. “The shad have moved into that area and all those fish are post-spawn. He caught four of his weigh fish on a lipless crankbait, something he hadn’t relied on much this week. He did incur a 4-ounce dead fish penalty and lost a 4-pound class fish this morning that certainly would’ve helped him. “I feel like I’m going to need 17 to 18 to have a shot at it,” he added. Matt Reed is hoping his weights continue to climb one more day. Reed is taking a cautiously optimistic approach into the final day. His stringers have increased in weight each day while Cox’s and Lehew’s continue to shrink. Thrift plans to head back to Lake Griffin Sunday morning intent on catching the 5-pounder that eluded him today. Beyond that, he’s not sure there are many fish left where he’s been. That’s why he’s pretty excited to make it through to the final day. “I’m real happy with it,” he said. “I know I’m running out of fish. I’m happy to have caught what I did. I think anybody in the top 10 has a legitimate chance. He said a square-bill crankbait has been his best weapon so far, but a late-day audible today gave him another option for tomorrow. Bradley Dortch has had at least one quality bite like this each day. Dortch feels that if he’d landed everything he hooked this week, the rest of the finalists would be chasing him tomorrow. As it stands, he’s he 3-07 behind Cox with a legitimate shot to contend for his first FLW Tour win. “I stand as good a chance as anybody,” he said. 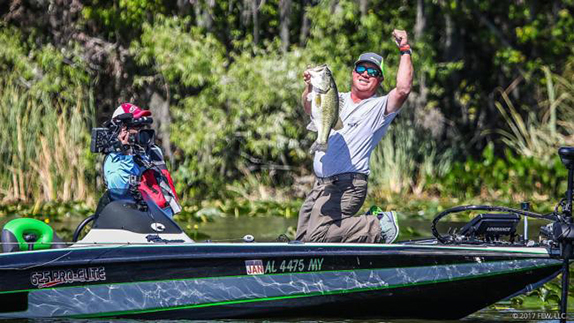 He’s spent his whole tournament jumping between Little Lake Harris and Lake Harris and he’s tapped into a combo pattern of throwing a lipless crankbait and flipping around some pads. He lost three good bites this morning, but recovered later with an 8-06 kicker that would’ve been the big fish of the event had Britt not caught his giant. “I’ve been getting at least one 7- to 8-pound bite each day,” he said. Britt’s goal on Friday was to catch 16 or 17 pounds and give himself a shot at making a top-50 paycheck. When he tallied nearly 20 pounds and made the top-20 cut, he figured everything else would be gravy. Tomorrow, he’ll get his first taste of a Sunday in a Tour event and he couldn’t be more stoked. It wouldn’t have been possible without the 9 1/2-pounder that ate a lipless crankbait around 11 o'clock this morning. He scooped it up and swung it in the boat and was able to cull a 1-pounder – an 8 1/2-pound upgrade. He hoped it would trigger some momentum that would carry him possibly to another 20-pound bag, but it didn’t materialize. > Day 3 stats – 20 anglers, 17 limits, 2 fours, 1 three. The following anglers missed the cut and will not compete on day 4.